Julie Buffalohead is an artist living in Minnesota. She is an enrolled member of the Ponca tribe of Oklahoma. As the daughter of a Ponca historian father and a white anthropologist mother, she was raised away from away from her tribal homeland. Her work is currently exhibited at the Denver Art Museum in Eyes On: Julie Buffalohead. Buffalohead’s work is fanciful, full of animals behaving in unusual ways, dressed as humans, wearing masks and belts of ribbon work. Particular animals are associated with each Ponca clan and sub-clan. She uses these relationships to inform her work. Her images abound with tricksters and storytellers. Coyotes and rabbits, foxes and ravens, all cavort, admonish, tempt, comfort and cajole. In What We See When We Read, author Peter Mendelsund examines the phenomenology of reading—how we visualize images from reading works of literature. His thesis is that we, as readers, participate in the creation of the world of the story, especially as it relates to images. Characters in great works of literature are seldom fully described physically. Subtle authors rely on gesture, the shape of a hand, the timber of a voice, the repeated habit of speech or movement. Buffalohead does the same in her compositions. The images are there, but no explicit message. The world bleeds off the edges. Characters exist in opposition to each other. There is history between them; there is also a future. The immediate impulse of the observer is to begin to fill in the narrative. This is a direct result of the process Buffalohead describes in the creation of her works. Her process has parallels to the writing process. Starting with two characters in opposition, the writer explores a conflict over many drafts. A narrative begins to develop. In the flow of creation, new characters present themselves. Things happen in the writing. The writer observes, rearranges, reimagines; narratives evolve. Characters inhabit a gesture, a need, a goal. This process doesn’t end. Buffalohead’s work is so full of this “creatively working through something” that the observer is immediately drawn into that process along with her. To look deeply at her paintings is to participate in the narrative, not as a puzzle to solve, but a snapshot in the midst of a history. A moment to contemplate, work through the possibilities of past, present, and future. Julie Buffalohead (Ponca), The Trickster Showdown, 2014. Features screen printing and lithography. Courtesy of Julie Buffalohead. Buffalohead’s canvases are frequently divided into some form of diptych. Two creatures inhabit positions of opposition, they communicate across a space. Gazes are pregnant with unspoken thoughts, gestures carry an unheard voice and direction that the observer feels drawn to complete. Predators gaze at prey. The living contemplate the dead. Another artist comes to mind who lived away from a homeland, focused the subject of his paintings on specific cultural symbols, and frequently painted subjects in the act of gazing at each other. When looking at Buffalohead’s works I experience the same whimsy, subversion, and dreamlike contemplation that I feel when I contemplate a Chagall. 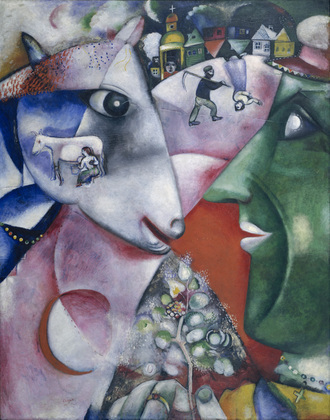 Marc Chagall, 1911, I and the Village, oil on canvas, 192.1 × 151.4 cm, Museum of Modern Art, New York. Chagall, too, painted contemplations of living within the structure of a society, and a faith, that stretches back in time. Taboos, that were born of necessity, rules defining how to be in the world, now shape an identity, tied to land and also echoing ancient actions across time and space, informing the shape of thoughts in a present moment. The past touching the future. Julie Buffalohead (Ponca), A Little Medicine and Magic, 2018. Oil on canvas; 52 x 72 in. Courtesy of Julie Buffalohead and Bockley Gallery. Image courtesy of Julie Buffalohead and Bockley Gallery. Buffalohead’s work is intensely personal. In Blood and a Single Tree, a bobcat is seated in a chair, dressed in a black suit and tie. He contemplates a dead deer who wears a belt of ribbon work, prone on the floor across from him. The figures are placed in a blood-red room with a single, small window. Outside is a distant, solitary tree in a vast plain. Raccoons and ravens interact, drawing on the wall, sniffing at the bobcat’s feet, reaching towards the window. The work was born out of Buffalohead’s personal family tragedy: the death of her cousin. The personal intensity combined with the placement of the work, alone on the far wall of the exhibit, physically pulls the observer toward it. The piece creates an atmosphere that compels contemplation. One of the panelists at the Logan Lecture shared a personal interpretation involving the power of patriarchy. Last week I brought three fifth grade boys to the exhibit. That was the work they were most drawn to. 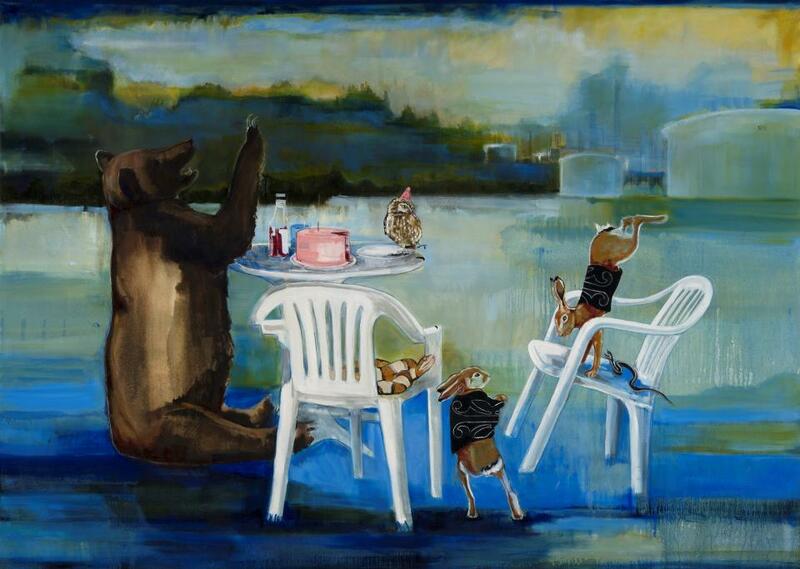 They sat on stools before the painting and discussed what was happening for twenty minutes straight. No other work caught their attention in the same way. That alone is a testament to the power of Buffalohead’s work. She invites this engagement with her work. Observers co-create and experience the world of her paintings informed by the archetypes in their own subconscious. If you have the chance, go, grab a stool and gaze. Eyes On: Julie Buffalohead will be at the Denver Art Museum until February 3, 2019.